AMADA MODEL M2045, 78’’ X 3/16’’ MECHANICAL POWER SHEAR, SQ ARM FRONT OPERATED POWER BACK GAGE. 1989 AMADA PEGA 345 CNC TURRET PUNCH, 33 TON CAP, AUTO INDEX, 40 STATION, THICK TURRET, FANUC 6M CONTROL, S/N AQ450009. AMADA CS-220 HYD CORNER NOTCHER, 10GA CAPACITY. AMADA RG-80 CNC HYD PRESS BRAKE, 8FT X 88 TON, WITH HURCO AUTOBEND IV CONTROL. 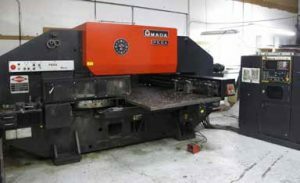 AMADA VELA 355 CNC TURRET PUNCH, 33 TON CAP, 16 STATION TURRET, S/N V55013. LARGE SELECTION OF PRESS BRAKE TOOLING FOR AMADA. BRIDGEPORT VERTICAL MILL, J HEAD, 1 HP, WITH POWER FEED TABLE. TIMESAVER MODEL 50-37M, 37’’ WIDE BELT SANDER, S/N 12167. DI ACRO MODEL 14-48- 2, 4FT X 14GA HYDRA MECHANICAL PRESS BRAKE WITH MANUAL BACK GAGE, S/N 6821178399. STUD WELDER, DRILL PRESSES, AIR COMPRESSORS. SPOT WELDERS, TOOLING, RACKS, PUNCH AND DIES. PALLET RACKING, SHELVING AND ETC.